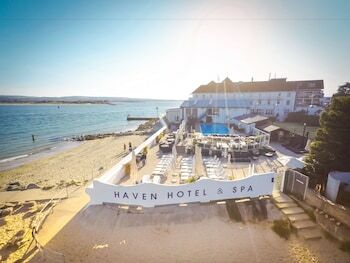 With a stay at Haven Hotel in Poole, you'll be on the beach, within a 15-minute drive of Bournemouth Beach and Sandbanks Ferry Terminal. Featured amenities include a business center, complimentary newspapers in the lobby, and dry cleaning/laundry services. Event facilities at this hotel consist of conference space and meeting rooms. Self parking (subject to charges) is available onsite. When you stay at New Flying Horse Inn in Ashford, you'll be 13 minutes by car from Willesborough Windmill. The front desk is staffed during limited hours. Free self parking is available onsite. With a stay at Paddington Southwick Street Apartments in London (Paddington), you'll be a 5-minute drive from Marble Arch and 5 minutes from Hyde Park. With a stay at Sapphire Hotel in London (Hammersmith), you'll be a 5-minute drive from Hammersmith Apollo and 8 minutes from Westfield London Shopping Centre. With a stay at Carnson House in Penzance, you'll be within a 5-minute walk of Wharfside Shopping Centre and St John the Baptist Church, Penzance.